Joseph Hardman was born in 1893, son of a yeast dealer, in the Lancashire mill town of Radcliffe, near Manchester. In 1911, Joseph and his brother Walter came to Kendal in search of work, and set up the 'Kendal Window Cleaning Company'. He joined the local photographic club, found he had a natural aptitude, gaining some success in local newspapers and decided to set up as a freelance photographer. He travelled up to two hundred miles a week by taxi to different parts of the Lake District, Westmorland, Cumberland and beyond. Edith, his wife, accompanied him and kept accurate details of all the pictures he took - recording the great changes in agriculture and the rural way of life from the 1930s to 1960s. He followed the agricultural calendar - ploughing, sowing, hay-time and harvesting. Capturing the many country pursuits and pastimes from fox hunting and fairs, to shepherds' meets and early tourism. He took over 50,000 photographs. One picture can stand for the whole story. Bearded Isaac Cookson, a Westmoreland shepherd, stands with a sheep straddled across his shoulders. The forelegs are grasped together in his strong left fist, the hind legs in his right. He wears a heavy old coat over his three-piece suit and an old hat is pulled down to offer his twinkling, sparkling eyes some shade from the bright sun. His shepherd's crook is held against his chest. There is that slight, confident smile on his lips which shows he is a master of his profession. And there is an expression on the sheep's face which shows that it is resigned to the will of its master. Centuries of farming life are captured in this picture. It was the work of a largely unsung man who has left us a great legacy. In the Museum of Lakeland Life in Kendal are over four and half thousand glass negative photographs, the work of one man, Joseph Hardman. He dedicated himself to recording the life of the people of Lakeland in the decades just before and after the Second World War at a time when the old ways in the fields were rapidly disappearing. He earned his own living as a window-cleaner. There is a picture of him leaning on his tradesman's barrow outside a house in Kendal. The barrow, with its cartwheels and wooden legs, carries a heavy wooden ladder, its two sections equipped to be manipulated by a rope mechanism. It carries the legend: "Kendal Window Cleaning and Carpet Beating Company. William Hardman, Proprietor". A galvanised bucket hangs from the rear of the cart and Joseph Hardman himself, in his white overall beneath his jacket, leans against the ladder. He is a big, strong-looking man with a weather beaten face. His hair is parted down the middle and his eyes seem to be sharply scrutinizing the photographer. He is a man more accustomed to be on the other side of the camera. And he was as much as work and finance allowed. He might travel two hundred miles a week by taxi as he began to earn some money from his photographs. He recorded the changing rural scene. There's Joe Weir bringing his hounds to the Mardale Hunt. There's Jimmy 'Whiskers' Inman - and he is most wonderfully, gloriously whiskery - threshing the corn with a flail in a barn at Draw Well in the Lyth Valley. And there's Mr Moore at Outerthwaite Farm, Flookburgh, striding across the ploughed field sowing oats with a seed fiddle. That picture was taken on 21st March, 1961. The details of these photographs, and most of the other fifty thousand which Joseph took, were recorded meticulously by his wife, Edith, a childhood friend from his early days in Radcliffe, Manchester. Near Levens the white gulls feed in the furrow as a man, bent-backed, follows the plough pulled by two plodding horses. In the heart of the Lakeland fells, a man leads a horse pulling a wagon brimming with hay. At Hodge Hill Hall the mounted huntsmen enjoy a stirrup cup as the eager hounds await the day's hunting. Tommy, the horse, waits patiently in the shafts of his cart on the sands of Morecambe Bay as Robert and Elizabeth Ellen Wilson from Bolton-le-Sands stoop to gather cockles in the wet sand. And, on a snowy Shap summit, heavy lorries and cars make their slow way north. These are wonderful pictures. 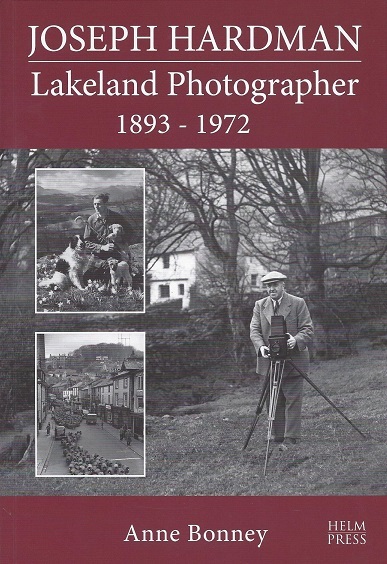 Tom Sarginson, one of Joseph's newspaper editors wrote: "With his camera he has mirrored the life of Lakeland, its places and its people in the minds of thousands who have never seen it." Anne Bonney has assembled a fine portrait of a man who deserves far greater recognition.